To understand future climate scenarios, scientists construct complex climate models. Good climate models take into account paleoclimate data, thermal inertia, the effects of oceanic and atmospheric currents, and the cooling effects of sulfate aerosols, among many other factors. Complex models require the use of very powerful computers to make these calculations. Climate models have many uncertainties: Among the most impor--tant of them is the difficulty of predicting how humans will behave in the future. The models cannot predict, for example, how much carbon people will emit into the atmosphere. Will CO2 emissions increase at the same rate they have for the past decade? Or will they increase at an even higher rate due to improvements in lifestyles in the develop--ing world (and even further improvements in the developed world)? Or might they decrease due to conscious changes in lifestyle or tech--nology? Because human behavior is unpredictable, climatologists construct models using different estimates for these numbers, ranging from conservative to extreme. For example, a climatologist might input an annual reduction in carbon emissions into a conservative model or allow CO2 emissions to grow rapidly using an extreme model. After the calculations are made, the results will be very different. Models of future climate look at the effects on the Earth's system of various increases in greenhouse gas levels or in temperature. The simplest of them are called commitment models, which predict the responses that are inevitable due to greenhouse gases that have already been added to the atmosphere. A commitment model predicts the amount of warming that will occur as thermal inertia is overcome, even if people stop adding greenhouse gases to the atmosphere. For example, the temperature commitment for greenhouse gases released as of 2000 is a rise of between 0.9° and 1.8°F (0.5° and 1.0°C) by 2100. Commitment models are extremely unrealistic because they assume that people will immediately cease emitting greenhouse gases. Their value is in providing a baseline picture of the inevitable changes to come. Many models of future climate assume that greenhouse gas levels will be stabilized at a temperature or a CO2 level that society chooses. These models require that people choose a value and actively reduce greenhouse gas emissions to reach it. Some modelers use a doubling of atmospheric CO2 from its preindustrial value of 280 ppm. A recent report says that a CO2 value of 560 ppm will cause average global temperature to rise up to 5°F (2.8°C). The doubling model does not take time into account, so there is no time frame for when this doubling will occur. To determine when this CO2 level will be reached, a rate of change of CO2 values must be figured into the model. One commonly used rate of change is an increase in CO2 by an extra 1% per year. 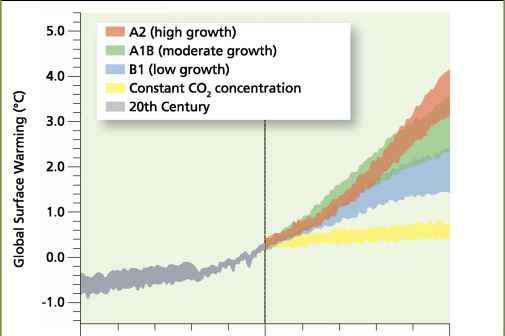 In this model, CO2 doubles over preindustrial values by about 2080. Indeed, a value of 560 ppm CO2 by 2080 is not unlikely. The business--as--usual model assumes that emissions will rise along the same trajectory they have been on for the past decade, and that there will be no efforts to reduce greenhouse gas emissions. At this rate, CO2 emissions in 2015 will be 35% greater than they were in 2000, and in 2030 they will be 63% greater than they were in 2002. The business--as--usual model results in CO2 levels over 600 ppm and a temperature increase of 0.9 to 3.6°F (0.5 to 2°C) by 2050. (Thermal inertia would keep the temperature from rising higher.) By 2100, CO2 could reach 880 to 1,000 ppm, a level not seen for at least 30 million years, with a certain temperature rise of between 3.5 and 8°F (2 and 4.5°C) and a 10% chance of an even greater rise. Most models stop at the year 2100 or at a doubling of CO2, but one business--as--usual model by scientists at the Lawrence Livermore Laboratory in California was allowed to run out to 2300. This model calculated what would happen if people continued to use fossil fuels until the Earth's entire supply was exhausted. The model run began in 1870 and predicted a fairly accurate increase in temperature of 1.4°F (0.8°C) by 2000. By 2300, there was a quadrupling of CO2 levels from preindustrial to 1,423 ppm, and global surface temperatures were 14.5°F (7.8°C) higher than today. Land and polar areas warmed more, with the most extreme warming of more than 36°F (20°C) taking place over the Arctic. The oceans absorbed a great deal of CO2 and became more acidic, with the potential of harming marine life. As seawater temperature surged, much of the ocean's dissolved CO2 was driven back into the atmosphere, which further enhanced warming. The most drastic changes came in the twenty-second century, when greenhouse gas emissions rates were the highest and the environmental changes—in precipitation, extent of sea ice, and other features—were the greatest. Ice and tundra gave way to forests, and Northern Hemisphere sea ice cover disappeared almost completely by 2150. The study's lead author, Govindasamy Bala, recognizes some weaknesses in the model but says that correcting the weaknesses would actually make the situation more drastic. The model assumes that soil and living biomass on land are carbon sinks but does not take into account a few factors such as the clearing of forests. In a 2006 press release about his study, Bala said, "We definitely know we are going to warm over the next 300 years. In reality, we may be worse off than we predict." In the alternative scenario, people quickly and severely limit greenhouse gas emissions. CO2 emissions level off by the end of this decade, slowly decline for a few decades, and begin to decrease rapidly by mid-century. Depending on the magnitude of the greenhouse gas emission reduction, this model predicts an increase of less than 2°F (1.1°C) this century. The models discussed above are global models, but local models can be constructed as well. Global models leave out some very important information. A good example is the effect of global warming on the Arctic. A global average temperature increase of 5°F (2.8°C) means a one- or two-degree increase at the equator but a 12°F (6.7°C) increase at the North Pole. This has profound implications for melting sea ice and ice caps, for polar ecosystems, and for the climate system due to the positive feedback of reduced albedo. Different models of climate change predict different temperatures by 2100, depending on whether or how much greenhouse gas emissions are restricted. The averages of the different models are included in the gray area; the colored shading encompasses projected growth ranges for the twenty-first century. rises to 18°F (10°C). 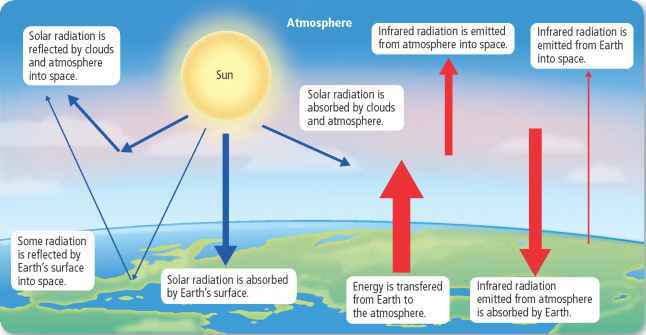 Therefore, unless greenhouse gas emissions are also curbed, a decrease in air pollution will increase global warming. While the timing and magnitude of changes due to rising temperature cannot be known with certainty, climatologists agree that all models point in the same direction. Another point of agreement is that climate change will not continue to be gradual; when thresholds are broken, climate will change rapidly.